BRYAN EATON/Staff Photo. 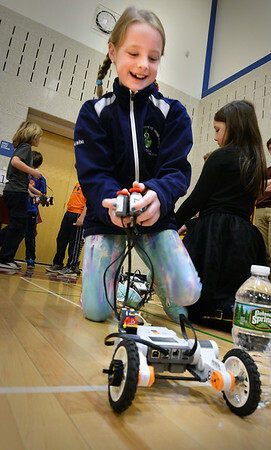 Erin Casco, 8, crosses the finish line with a Lego NXT robot at the Bresnahan School at a booth manned by the Newburyport High School Engineering and Robotics class. The school was holding a STEM (Science, Technology, Engineering and Math) Expo to stir curiosity in those subjects.